9 Reasons Our Photo Totes and Pillows Are Better—Plus Easiest To Order: 1) They’re made of a poly suede fabric and dye sublimated on state of the art equipment; 2) You can have different pictures on each side; 3) We’re offering 17”x17” pillows, 3 bag styles and 2 wall hanging sizes; 4) Pricing starts at just $65; 5) Simply upload or email your photos to us (that’s ALL you need do!) and we’ll handle all image cropping/layout/design (plus you can request a PDF for review) and we’ll also automatically sharpen, color adjust, etc., your pictures; 6) Or send us your photos before ordering and we’ll gladly pre-check image quality, etc. ; 7) Either way, we’ll ALWAYS let you know before printing if your photos aren't adequate; 8) Plus, for an additional fee (starting at just $10), we can combine photos in a custom design or collage; and 9) We can similarly add text, logos, graphics or even retouch your images. Photo Blankets: We strongly recommend ordering all blankets from our 1- and 2-Sided Photo Blankets page. However, for those still wanting a 50”x60” Photo Throw of low-pile fleece with whip-stitched edges that when printed may more closely complement one of our totes or pillows, we’ve included such an option under “Select One” below. What You Also Need To Know: We not only offer three kinds of fully-lined hand-finished bags starting at $65—a 17"x17" Tote with black straps, a 16"x14 Eco Tote with a bottom shelf and a 16”x12” Purse with black handles—-we're also able to print different pictures on each side of those bags, as we can do with our Photo Pillows. Plus, we offer two sizes of Wall Hangings. And all of these products are made of a poly suede fabric printed with dye sublimated inks. We can also add a name or short phrase for $10 per line or a logo or other graphic for $10 each. And as you'll see elsewhere on this page, our ability to further enhance and otherwise manipulate your images goes far beyond the aforementioned extras. So feel free to Contact Us about any special needs you may have. Meantime, the highly photo realistic way images print on these products, compared to our woven equivalents, underscores just how important the resolution and clarity of your photo will be. As a result, if you've any questions about the pictures you're planning to use, you're welcome to forward those images to us for review before you place your order. If you’re ready to order, simply follow the steps below. Orders usually ship within one or two weeks but delivery can vary, depending on what you're ordering and the time of year. So after receiving your order, we’ll let you know if we anticipate anything different. Plus you’re welcome to Contact Us for further info, if you think you’ll need custom design or for anything not covered here. Valid file types are .png, .psd, .jpeg, .jpg, .ai, .bmp, .pdf and .tif. Please Note If you would like to order 12 or more of the same product, please visit our custom quote page or call us for quantity discounts. "The throw arrived yesterday--it is gorgeous!!!" a Kentucky mom exclaimed, referring to a Photo Throw she ordered of her daughter and horse clearing a jump. "I can't wait to see her open her gift. Thank you!" And so we assume it couldn't have been much of a surprise when, not long after being opened, a picture of that throw appeared on her daughter's Facebook page, quickly bringing the following replies: "that is soooo cool i want one! haha" (at 3:56 p.m.), "Like that's awesome:D" (at 3:57 p.m.), "Like haha I love it!" (at 3:57 p.m.), and so on. Until at 4:13 p.m. came "YOU'RE BOTH STARS" and five minutes later "This is the coolest gift ever hah!" And what exactly did her daughter think of it? "She loves it totally," her mom reported. Similarly, several months after moving on to what her mother described as a "new fancy horse", a 17-year-old Minnesotan was given a Photo Pillow with a picture of her and her old favorite competing: "It looks really great," the mother said. "Emma and I both love the pillow!" 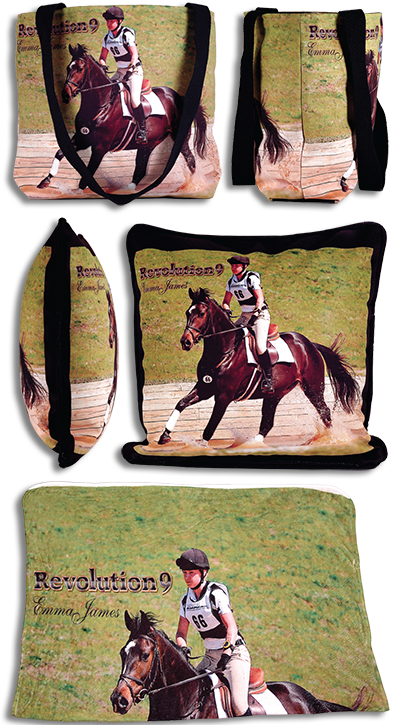 Likewise, a Photo Tote with a different picture of daughter and horse on each side proved "a huge hit," according to a Maryland mom following last Christmas. "It turned out great and will be cherished for a lifetime!" 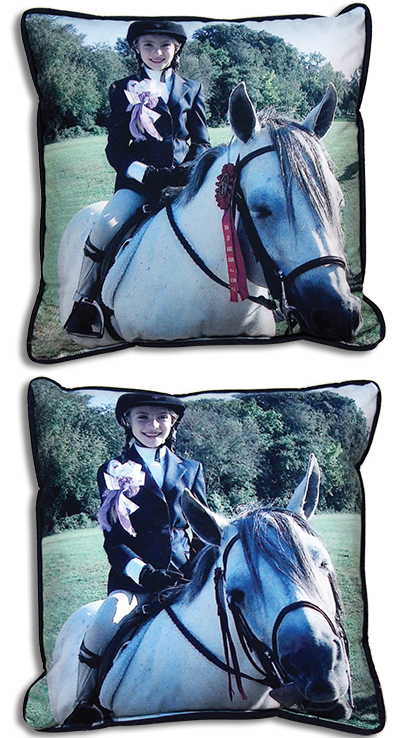 And a New Jersey mother and daughter had a similar reaction to a Photo Pillow showing horse and rider truly decked out for a show (and with one of them sporting a red ribbon) in two different pictures. "We love it the mother shared, although it perhaps took a bit more work on our part to get them there. You see, just as we were ready to proceed with both a Pillow and a Throw, the mother had one additional request: "Please confirm you can take the people out of the background (of the photo)." And so we did, along with sharpening and otherwise improving the image's overall tone--and for a before and after look at both pictures, please click here. Or for a few more examples, click here. Not sure your photo's good enough? Trying to decide between several pics? Or need some other assistance? Go to our Custom Quote page to upload any images you'd like us to review or to have questions answered before placing your order. And for more product info, call us at 1-877-N1-Horse (1-877-614-6773) or fill out a Contact Us form and we'll get back to you as soon as possible. Your photos, by the way, can be of any subject (kids, pets sports, cars, etc.) and do NOT have to be horse related.